We provide a customized program for every specific situation and we deliver outstanding results with the use of a variety of lasers, specifically designed to treat your particular conditions. Visit our testimonials page to see what some of our clients have to say. Please visit our Clinic page to find out more or contact us to book your free consultation. 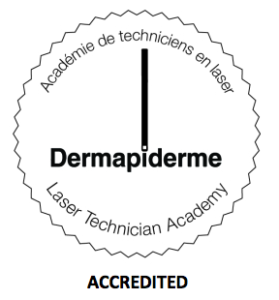 Obtain your laser & IPL technician certificate from the Dermapiderme Academy and advance your career. Dermapiderme is an accredited facility that offers an extensive laser & IPL aesthetics training program for aestheticians, electrologists and nurses, to provide knowledge and skills in modern, advanced cosmetic techniques, with a particular focus on safety to meet today’s evolving regulations. Please visit our Academy page to find out more or contact us to discuss your objectives.